World leaders are meeting this week in New York to discuss climate change and start work toward a new climate treaty. 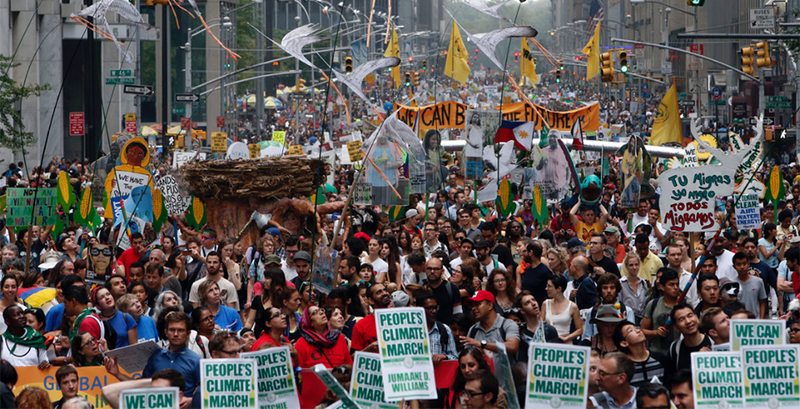 As their discussions began, hundreds of thousands of protesters gathered in the streets to demand more political action to stop global warming. An estimated 400,000 people marched on Sunday, demanding quicker action to reduce carbon emissions. That crowd—including more than 20 Wellesley community members—is up from the estimated one thousand people who turned out for a similar effort just eight years ago. Hahrie Han, associate professor of political science, spoke with WBUR’s Radio Boston on September 23 to discuss what makes this and other protest movements capable of real political change. Han is the author of How Organizations Develop Activists: Civic Associations and Leadership in the 21st Century, which provides an in-depth look at the models and strategies that civic associations use for engaging activists in the digital era. Her book examines the challenges groups face in understanding how to engage more activists and leaders and provides a detailed glimpse of strategies they can use. “A central source of power for political organizations is their ability to engage people,” Han said. One of the Wellesley students who attended the march, Maggie Neel '18, offers evidence for Han's notion that many groups are mobilizing on the issue. Says Neel: "One thing I really took away from the experience was all the variety of people who were marching. I saw everything from 'green grandmas' to 'dreadlocked hippies.' It proved that climate change isn't a niche issue; it concerns everyone. The solidarity in the city was amazing." Listen to the full interview with Han, "How The ‘People’s Climate March’ Could Translate Into Political Action," on the WBUR Radio Boston website. Han also recently appeared on Australia's ABC News Breakfast discussing political organizing in the 2008 and 2012 presidential campaigns.